SlicingTech serves the needs of companies who require high precision, high volume wafer slicing. 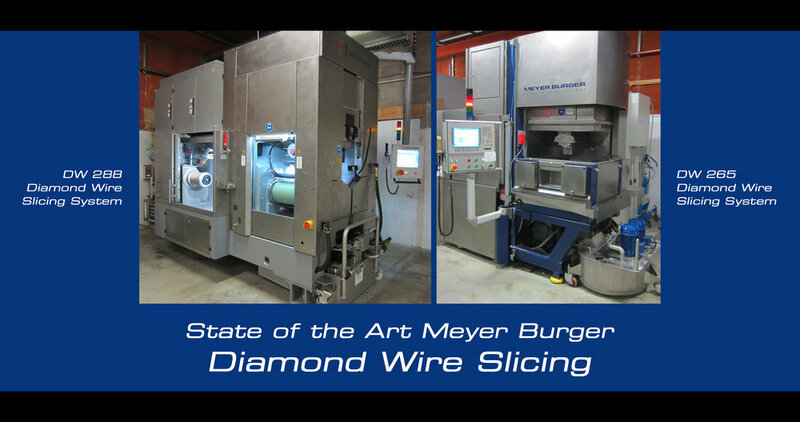 Along with a wide range of Meyer Burger wafer slicing systems, we now feature the world-renowned, state-of-the-art Meyer Burger DW 288 and Meyer Burger DW 265 Diamond Wire Slicing Systems for hard and brittle materials. SlicingTech services customers throughout the United States, Europe, Asia and the Middle East. Please call (610) 588-7884 or contact us for an immediate, confidential consultation. – Large table loading capabilities enable us to slice thousands of parts in as little as three hour cycle times, resulting in the lowest possible piece price. – Excellent surface finishes often reduce or eliminate additional machining operations, such as grinding or lapping. – Low kerf loss results in high part yields per run. These attributes contribute greatly to our ability to provide quick and efficient deliveries for any specified thickness on a wide variety of materials and sizes. Other materials can be accommodated. Please call (610) 588-7884 or contact us to discuss your slicing requirements.